Featuring stunning design, the Bugatti VELA Blender will bring a touch of Italian style to your kitchen, expressing a strong statement that both form and function are equally important. Why settle for boring design when you can have everyday objects that look as good as this? The base is made out of chrome steel and the body in chrome ABS. This lends a very sophisticated polished look to the run of the mill gadget. The carafe (flask) is made of glass of optimal thickness, a built-in lid and a polycarbonate batcher. 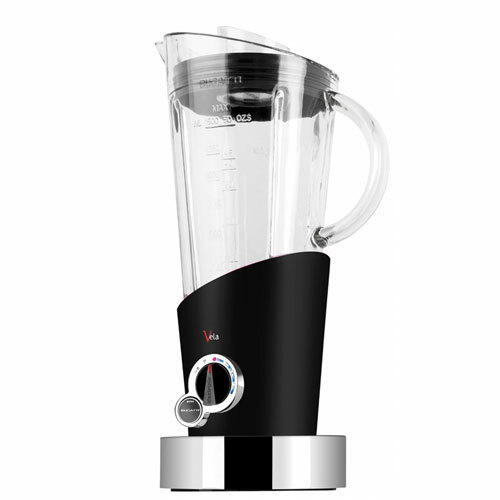 The 400-watt blender has three speeds and a pulse function. Due its professional design, the stainless steel blade is able to perform its function swiftly and precisely. Solid 18/10 steel: The jar can be stored on the power base in many different positions without the need to lock in on to the base. The reinforced clear glass mixing jar features content marks on both sides and can blend up to 1.5 litres (50oz) at a time. The high quality solid steel blades are uniquely designed to mix ingredients powerfully. Ice can be crushed in an instant. Filler cup: The lid features a polycarbonate filler cup with filler marks to pour exact amounts of ingredients in to the glass jar. The cup can be bayonet lacked in to place to form a knob to lift the lid.